This SharePoint tutorial explains, the major difference between SharePoint classic and modern experiences in list and library in SharePoint Online or SharePoint server 2019. In 2016, Microsoft has newly introduced the new UI experience called “Modern experience” for lists and libraries in Office 365 SharePoint Online. SharePoint Modern Experience – All You Need to Know! The SharePoint modern experience offers better user experience which is faster than classic experience, More responsive and displays better in a mobile device like tablet and desktop, etc. The classic experience still exists in SharePoint, so a user can always capable of switching to modern to classic view and back to the modern view. The organization will set the default experience of lists and libraries in site collection level or list settings level. You can find this article where the user can capable to switch the list and library experience. In Modern experience, the user can able to easily edit items in a list in SharePoint Online/2019. In Modern experience user ability to select multiple documents and download them as a single .zip file. In SharePoint modern experience, User easily to add reorder, resize, sort, filter, and group columns, and create custom views. 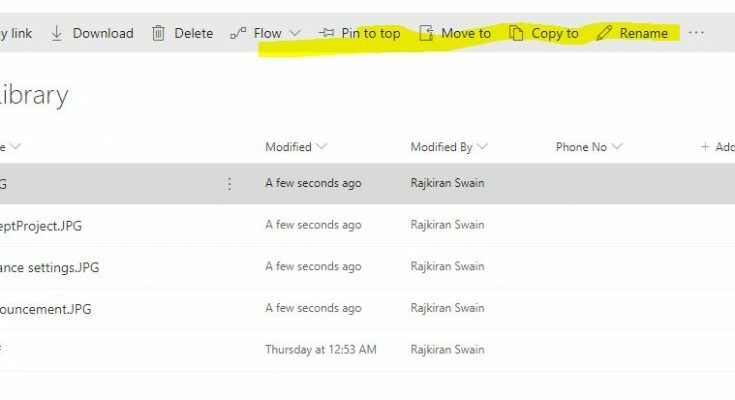 In Modern experience the user can able to create a Microsoft flow, PowerApps which is not there is the classic experience in SharePoint Online. In Modern experience, User quickly changes the file information and easy access to previews and additional details. In Modern experience, Improved the display of list with column formatting and list view formatting in SharePoint Online. In Modern experience, you can find the List or library settings in right side of the menu. In Modern experience user can pin documents to the top to highlight them. The new modern list and document library experiences are not available for users of Internet Explorer 10 or earlier. Customization of list or library may be affected while switching the default experience in SharePoint Online/2019. Microsoft has confirmed that there are no plans to permanently remove “Classic” mode, so you can fall back to that interface if you wish or need to do so. How to Set different permission on the SharePoint 2013 list view? The above are the major difference between classics and modern SharePoint lists and library, so you can find more difference once you start working on it.